Sweet potato (Ipomoea batatas (L.) Lam.) is a plant grown for its tuberous roots in tropical, subtropical and warm-temperate regions. Sweet potato tubers are a staple food or an alternative food in many countries and part of the production is used for animal feeding. Sweet potato is a perennial plant mainly grown as an annual. The roots are adventitious, mostly located within the top 25 cm of the soil. Some of the roots produce elongated starchy tubers that vary largely in shape, colour and texture depending on the variety. 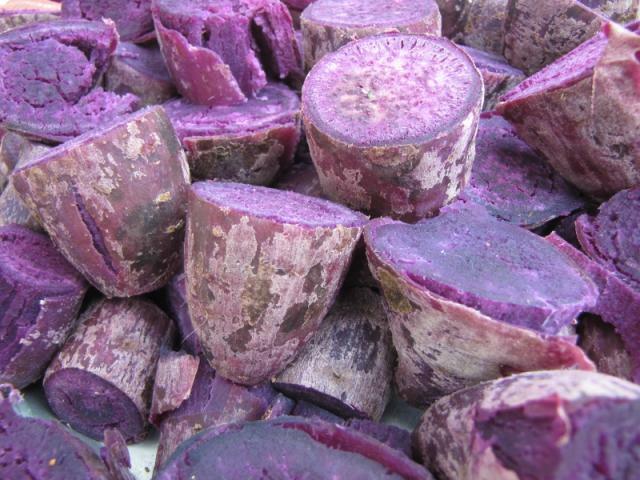 The flesh of the tubers can be white, yellow, orange and purple whereas their skin can be red, purple, brown or white. The stems are creeping slender vines, up to 4 m long. The leaves are green or purplish, cordate, palmately veined, borne on long petioles. Sweet potato flowers are white or pale violet, axillary, sympetalous, solitary or in cymes. The fruits are round, 1-4 seeded pods containing flattened seeds (Ecocrop, 2010; Duke, 1983). Sweet potatoes are cultivated for food in more than 100 countries, sometimes as a staple food but usually as an alternative food. Because of their fast growing period and low input and work requirements, sweet potatoes are often planted in Africa as a security crop or famine prevention crop (Scott et al., 1993). The starchy tubers are used as a vegetable and can be boiled, baked, fried (to make chips), dried and ground into flour to make biscuits, bread and other pastries. They can be cooked and frozen. Leafy tops are eaten as a vegetable (Duke, 1983). 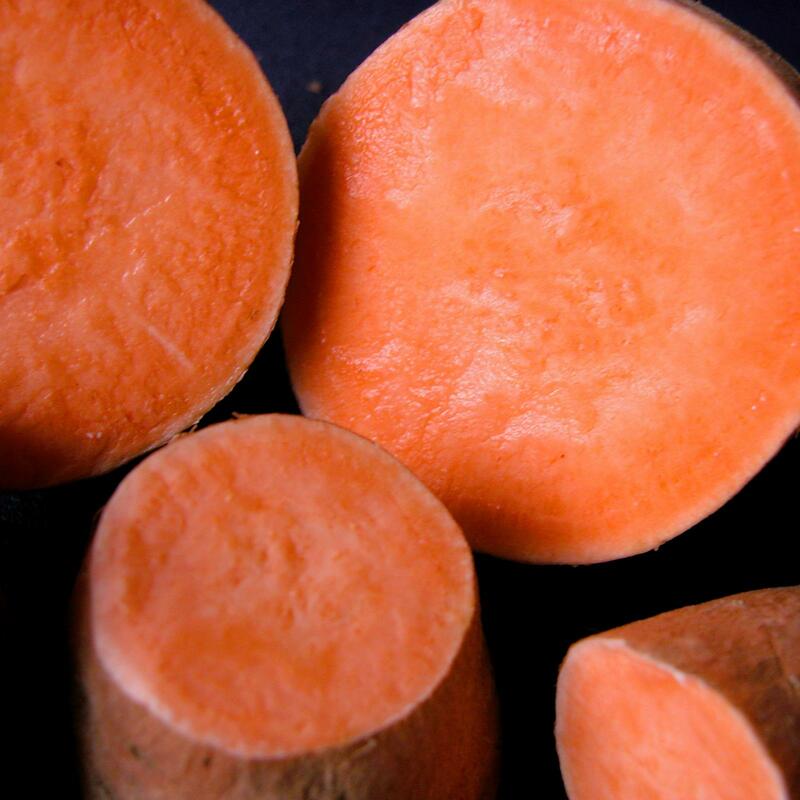 Some orange sweet potato tubers grown in the USA are used as a natural source of dye, or valued as a healthy food due to their high beta-carotene content. Their very high-grade starch is appreciated for food and by the pharmaceutical industries (Chittaranjan, 2007). Sweet potato are also a very valuable source of feed for all classes of livestock (Woolfe, 1992). The tubers are relished by pigs and cattle. In 2007, half of the sweet potato tuber production went to animals or to the starch industry (Lebot, 2009; Chittaranjan, 2007). Sweet potatoes can be used on-farm or as an ingredient in commercial compound feeds (Scott, 1992; Gupta et al., 2009). The economic value of the sweet potato as animal feed used to be debatable because producing them at 30% DM was as costly as importing grain at 89% DM (Woolfe, 1992). However, new varieties now produce more edible energy per ha per day than any other major food crop and 30% more starch/unit area than maize (Ecocrop, 2010; Chittaranjan, 2007). Sweet potato tubers are used as an energy crop: the tubers can be fermented to produce alcohol, and the plant grows in areas where maize does not (Woolfe, 1992). Other sweet potato products are suitable for livestock: see the datasheets on Sweet potato by-products and Sweet potato forage. The sweet potato is thought to have originated between the Yucatán Peninsula of Mexico and the mouth of the Orinoco River, in Venezuela. 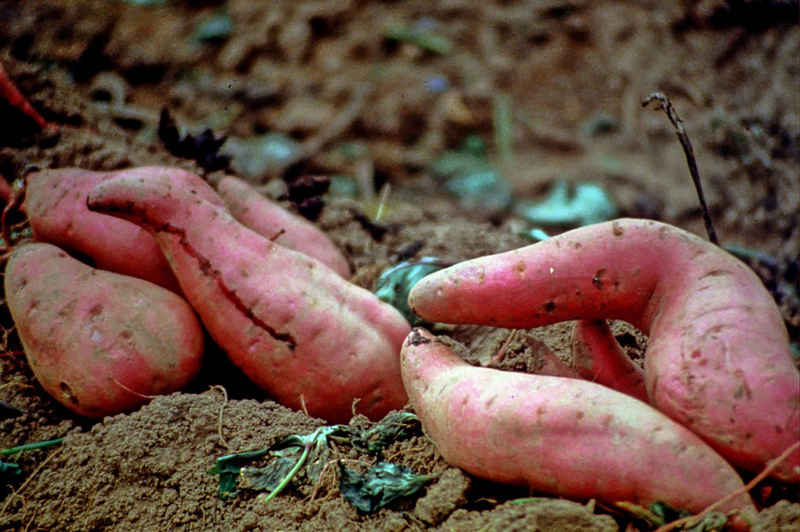 Sweet potatoes varieties as old as 8000 years have been found in Peru. They then spread to the Caribbean and Polynesia. They are now widely cultivated between 40°N and 32°S, up to an altitude of 2000 m (and up to 2800 m in equatorial regions) (Ecocrop, 2010; Paneque Ramirez, 1992). The main sweet potato producers are China, Indonesia, Vietnam, India, Philippines and Japan in Asia, Brazil and the USA in the Americas and Nigeria, Uganda, Tanzania, Rwanda, Burundi, Madagascar, Angola and Mozambique in Africa. The area under cultivation was 8.5 million ha in 2009. It is one of the seven food crops with an annual production of more than 100 million t (FAO, 2010). Sweet potatoes are cultivated wherever there is enough water to support their growth: optimal annual rainfall for growth ranges between 750 and 2000 mm. Where the rainfall is below 850 mm irrigation may be necessary, but it should be stopped before harvest in order to prevent the tubers from rotting. The sweet potato is a warm-season annual, requiring 20-25°C average temperatures and full sunlight for optimal development. It needs a frost-free period of 110-170 days and growth may be hampered with an average day temperature below 20°C. Sweet potatoes thrive in well-drained loamy soils with a high humus content that provides a warm and moist environment for the roots. ﻿Optimal soil pH is between 5 and 7 (Ecocrop, 2010; Ecoport, 2010; Paneque Ramirez, 1992). Sweet potatoes are mildly drought-tolerant and can survive dry spells during the summer. However, low humidity impairs crop quality even if the plant resumes growth after water stress (Ecoport, 2010; Paneque Ramirez, 1992). Fresh or dried sweet potatoes can be given raw to pigs and cattle. They can also be chopped and sliced (to prevent choking) and mixed with household feed sources, such as sweet potato vines, rice hulls, maize husks or a purchased protein supplement, resulting in a better balanced and more digestible diet (Scott, 1992). Roots left in the field after harvest can be consumed by grazing animals (Dominguez, 1992). Unsold tubers can also be offered to livestock (Scott, 1992). Grated, chopped or sliced raw tubers can be ensiled with a small quantity of salt (0.5% NaCl) and feedstuffs such as rice bran, cassava leaf meal, or dried and ground poultry manure. The silage should be prepared as soon as possible after grating or chopping the roots. Injured roots should be avoided to guarantee good quality silage. The mixture is put into an air-tight plastic bag, and heavily pressed so that as little air as possible remains in the bag (Nguyen Thi Tinh et al., 2006). Ground sweet potato roots and chopped vines (1-2 cm) can be mixed together at different ratios ranging from 2.5:1 to 1:2.5 and put in plastic bags in order to make a well-balanced, good quality silage that can be stored for at least 3 months (Hoang Huong Giang et al., 2004). Cooking improves the feeding value of the tubers since it reduces trypsin inhibitors and improves starch digestibility (Dominguez, 1992). In the USA, tubers used for animal feed are cleaned, shredded or sliced, treated with sulphur dioxyde and dried rapidly, in the sun or in hot air drier at 80°C or higher. The dried product is fed whole or ground to cattle, pigs, sheep or poultry (Onwueme et al., 1994). The worldwide sweet potato tuber yield was 12.6 t/ha in 2009. 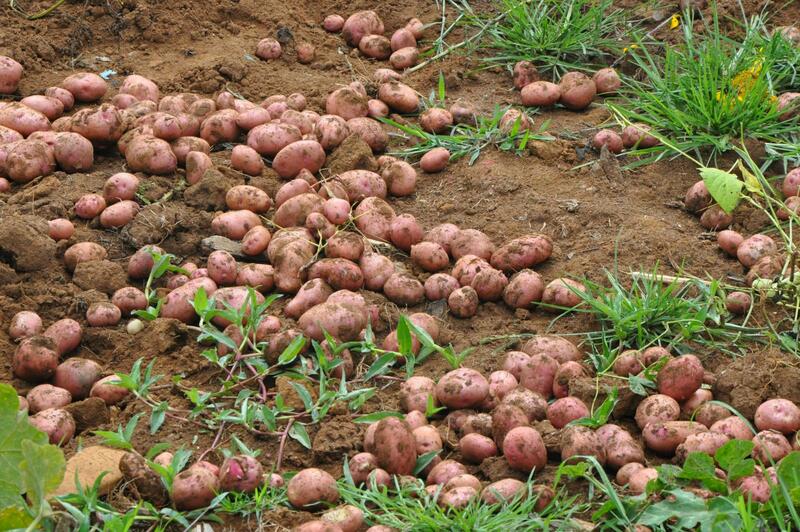 Average tubers yields were 5 t/ha in Africa, 10 t/ha in South America and 16 t/ha in Asia (FAO, 2010). The sweet potato is remarkably adapted to harsh conditions. It even thrives with very low inputs and under minimal horticultural practices. It grows very quickly, is relatively drought-tolerant and provides large amounts of nutrients usable during periods of feed scarcity (Scott, 1992). Sweet potato tubers are mainly an energy source due to their high carbohydrate content, which accounts for 80-90% of the dry weight. These carbohydrates consist of starch, sugars and small amounts of pectins, hemicelluloses and cellulose (Lebot, 2009). Starch is the main carbohydrate (about 75% DM) and is very resistant to amylase hydrolysis. Cooking increases the easily hydrolysable starch fraction of sweet potato from 4% to 55% (Dominguez, 1992). Sugar content can be extremely variable, usually between 1 and 12% DM, but some USA cultivars contain as much as 38% DM of sugars. The sugar composition of a cultivar, especially the sucrose values, gives a reliable indication of its sweetness (Lebot, 2009). The dry matter content of fresh tubers is about 30% and up to 45% in some varieties (Scott, 1992). Tubers are a poor protein source, as they contain about 4% DM of crude protein, less than half that of maize grain, and are poor in lysin and sulphur-containing amino acids (Dominguez, 1992). They have low contents of fibre (7% DM of NDF), fat and ash. Heat treatments and ensiling are very helpful in reducing trypsin inhibitor activity (see Potential constraints). Raw sweet potato tubers contain medium levels of trypsin inhibitors (Bradbury et al., 1992), which are still sufficient to decrease protein digestibility in diets (Dominguez, 1992). The trypsin inhibitor content is very variable between varieties (2.6 to 32.0 TUI/g; Ravindran et al., 1995). Moist heat treatment at temperatures above 80°C is effective in eliminating trypsin inhibitor activity (Zhang et al., 2001). Sweet potato tubers contain oxalate at up to 1.2 g/kg DM (Ravindran et al., 1995). They may also contain ipomoein, which has laxative properties (Duke, 1983). Sweet potato tubers are susceptible to many mould infections if they are not properly harvested and stored. Mouldy tubers can be toxic, resulting in lung oedema in laboratory animals and cattle (Wilson et al., 1971). Sweet potato tubers infected by Ceratocystis fimbriata, a common sweet potato mould, produce a potent toxic alkaloid called ipomeamarone. Cattle, which are particularly sensitive to ipomeamarone, may start suffering from dyspnea with rapid breathing within one day after eating contaminated sweet potato tubers and may die from asphyxia a few days later (Wilson, 1973). Mice submitted to ipomoeamarone suffered from severe kidney damage (Woolfe, 1992). The long-term feeding of sweet potatoes has been found to increase the likelihood of dental problems in cattle (MSU, 2010). Sweet potatoes fed whole can cause choking and even suffocation in cattle. This risk can be minimized either by chopping the tubers or, if the tubers must be fed whole, by using low troughs and preventing cattle from raising their heads while eating, and by reducing cattle feeding competition to keep cattle from rapidly gulping down sweet potatoes (MSU, 2010). Sweet potatoes can be used fresh, dried or ensiled (Lin et al., 1988). Like cereal grains, sweet potato tubers are rich in highly digestible starch and sugars and constitute a valuable source of energy for ruminants. However, the high dry matter degradability (above 85%) (Chanjula et al., 2003), and the high content of soluble carbohydrates may lead to acidification in the rumen (Szylit et al., 1978). Sweet potatoes should, therefore, be gradually introduced into the diet, and offered with roughages to minimize the risk of digestive disturbances (Otieno et al., 2008). Early reports comparing dried sweet potato tubers and maize for dairy production found that the tubers had a value that was between 88 and 98% that of maize (Mather et al., 1948; Rusoff et al., 1947; Woolfe, 1992). 36% dried sweet potato or maize in the diet of Jersey cows resulted in identical live weights and milk and butterfat production (Frye et al., 1948; Mather et al., 1948). Replacement of 50% maize with dried sweet potatoes, or substitution of sorghum silage with fresh sweet potatoes did not alter milk production. Feeding dried roots of orange-flesh varieties increased the vitamin A and beta-caroten content of the milk (Woolfe, 1992). Sweet potatoes give good results in beef cattle and are roughly equivalent to maize grain. They are palatable and it has been possible to substitute maize grain by 50% to 100% dried sweet potatoes while maintaining performance. For example replacing 50% maize by dried sweet potatoes resulted in higher daily weight gains (1.17 vs. 1.07 kg/day) and similar market prices as the maize diet, while total replacement led to slightly lower weight gains and prices. Replacement of 50% of the maize by sweet potatoes did not affect feed palatability and meat colour (Woolfe, 1992). Supplementation with nitrogen sources such as soybean meal and urea is preferable, and resulted in daily gains higher for the sweet potato-based diets (50 to 100% replacement) than for the maize-based diet (Woolfe, 1992; Backer et al., 1980). Sweet potatoes were found to be a better source of energy than molasses for beef cattle, perhaps due to a detrimental effect of molasses on cellulolytic activity (Backer et al., 1980). Mixing potato forage and sweet potato tubers can be a good feeding strategy from an economic standpoint (Backer et al., 1980). Cooking improved the palatability of the roots but not the feed efficiency. Steam-pelleting improved starch availability and urea utilization (Woolfe, 1992). Growing sheep fed 100% sweet potato tubers lost weight and scoured in less than 4 weeks, which may have been caused by the too low protein and fibre content of sweet potatoes. Mixing sweet potato forage and tubers resulted in better intake (658 g/day), weight gain (86.4 g/day) and nutrient utilization, as well as a lower cost per kg of live weight gain than from forage or tubers alone. A 50:50 sun-dried mix of sweet potato tubers and forage maximized economic returns from cultivating sweet potato for sheep feeding (Olorunnisomo, 2007). Sweet potatoes were found to be similar to maize grain for live weight gain in gestating ewes, and better for milk production and lamb growth in lactating ewes (Woolfe, 1992). Sweet potato tubers are a good source of energy for pigs, though inferior to maize grain (Woolfe, 1992). Starch digestibility was reported to be similar to that of maize (Tsou et al., 1989). The main drawback of sweet potato tubers is their low and unbalanced protein content, which requires the addition of protein sources to the diet in order to meet animal requirements (Woolfe, 1992). The low protein content and the trypsin inhibitor activity can have deleterious effects on the pig digestive process and result in a lower performance in growing and finishing pigs (González et al., 2002; Oyenuga et al., 1975). Young pigs fed ad libitum only on fresh sweet potato tubers gained very little weight (109 g/d when grazing, 136 g/d when pen-fed) because roots are bulky and intake by young pigs was insufficient to satisfy energy and protein requirements (Woolfe, 1992). Total cereal replacement by sweet potato tubers is, therefore, not advisable and may result in a reduced intake and performance (Dominguez, 1992; Ly, 2009; González et al., 2002). Substitution rates ranging from 40 to 75% have been proposed and recommendations vary according to root processing, animal types and protein supplementation, as summarised in the table below. For optimal pig growth, sweet potato tubers should be adequately supplemented with a protein source such as soybean meal or fish meal (Woolfe, 1992). The economic value of sweet potato tubers in a particular diet depends on the source and quantity of protein supplementation (Preston, 1995). Less expensive protein sources such as sweet potato vines or other protein-rich forages such as the white mulberry (Morus alba) or the nacedero (Trichanthera gigantea) can also be used (Araque et al., 2005; Dominguez, 1992; Göhl, 1982). Heat treatments, such as oven-drying or cooking, destroy trypsin inhibitors and improve the digestibility of energy and nutrients (Woolfe, 1992). Provided that an adequate level of protein supplementation is used, cooked sweet potatoes may totally replace maize for fattening pigs and increase live weight gain compared to raw tubers. However, when using soybean meal supplementation, pigs fed cooked potatoes had a poorer feed conversion than those fed maize (Dominguez, 1992). Some farmers in China and the Philippines prefer to boil the roots before feeding them to pigs. In Papua New Guinea, cooked root leftovers from human consumption are used to feed pigs (Scott, 1992). 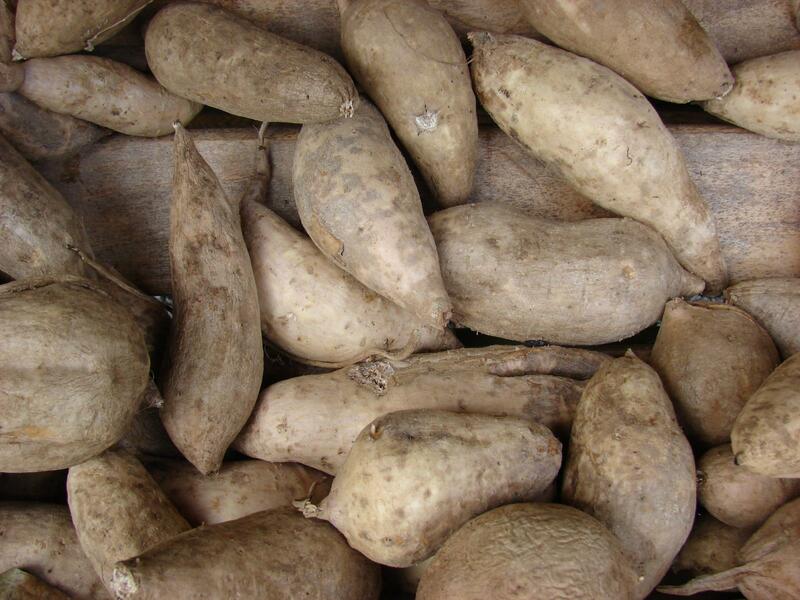 Sweet potato tubers can be used in poultry diets as a substitute for cereals, usually as dried meal. The lower protein and energy content of sweet potatoes compared to cereals have consequences on feed formulation, particularly on the need of appropriate protein supplementation (Woolfe, 1992). This can explain some of the variability observed in experimental results. At higher inclusion levels, the powdery texture of ground sweet potato can cause a decrease in feed intake (Ravindran et al., 1996). High values for starch digestibility (97.4%) have been recorded in older animals (Szylit et al., 1978) and it was found that the low digestibility of raw sweet potato starch in young birds (74%) increased with the age of the animal (Yoshida et al., 1962). The lower energy value of sweet potato compared to maize in young birds has been noted by several authors (Panigrahi et al., 1996; Yoshida et al., 1962). Sweet potato meal can be successfully used as a substitute for maize in broiler diets, but in most cases the highest substitution levels decrease performance. The recommended inclusion level is usually 20%. For example 25% sweet potato meal plus 10% molasses could profitably replace maize in growing chick rations (Latif et al., 1975 cited by Devendra, 1988). However, up to 30-40% sweet potato meal in the diet did not alter performance in some experiments (Gerpacio et al., 1978; Agwunobi, 1999; Ravindran et al., 1996), though the general relationship between sweet potato level and performance is generally negative. In some cases, inclusion levels higher than 10% reduced performance (Ayuk et al., 2009; Rosenberg et al., 1952). The effect of thermal treatments was found to be variable. In an experiment where raw starch was already fully digestible (97%), steam pelleting did not augment starch digestibility, feed intake and weight gain (Szylit et al., 1978). In young animals, increasing the drying temperature of the tubers from 40 to 80°C did not result in significant improvements in animal performance, which remained lower than those obtained with maize (Panigrahi et al., 1996). Other authors found thermal treatments to be beneficial. Starch digestibility increased at temperatures higher than 68°C (gelatinization point) (Morimoto et al., 1954). Pelleting had positive effects, especially for young birds (Kwack et al., 1975 cited by Woolfe, 1992). It has been suggested (Woolfe, 1992) that in some cases the improvement resulting from the thermal treatment of raw sweet potato tubers could be due to the reduction in trypsin inhibition activity, which is high in some cultivars (Ravindran et al., 1995). Sweet potato has been used in layer diets, but a general trend of decreasing performance has been reported. Safe inclusion rates should be limited to between 10 and 15% sweet potato meal in the diet, with proper protein and vitamin A supplementation. Replacing 50% of maize with a mixture of sweet potato meal (21% of the diet), wheat bran and sweet potato leaf meal was found to be acceptable though it significantly reduced egg production by 5.6%. Total replacement of maize (42% of the diet) decreased performance (Ladokun et al., 2007). A similar significant decrease in egg production (-11.6%) was observed when substituting maize with sweet potato meal at 20% of the diet, whereas the decrease (-4.2%) was not significant at 10% (Lee et al., 1979 cited by Woolfe, 1992). 15% inclusion of peeled sun-dried sweet potato meal maintained egg production, while higher rates tended to reduce performance, though only significantly at rates higher than 45% (Agwunobi, 1993). Dried sweet potato tubers profitably replaced 100% of maize grain in rabbit diets, without adverse effects on performance and blood characteristics (Agwunobi et al., 1997).